The organ was made in 1981. 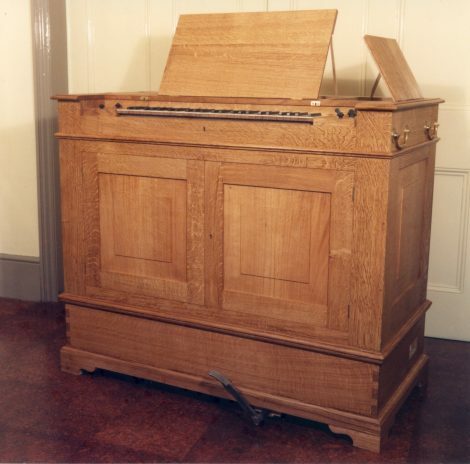 It was based on late 17th century English chamber organs. The Stop’d Diapason and Flute are copies. The case and the pipes are all made of oak. The compass is C- d³, with four available pitches. The 8ft and 4ft ranks can be tuned to any of the pitches and to different tuning systems. The pipes of the Fifteenth are tuned with lead flaps and are less flexible in their tuning. There is a foot pedal for raising wind, as well as a separate blower. The organ has been used in numerous recordings, with Peter directing the Parley of Instruments mostly in music from 17th and 18th century England.